Every three months, the TWT co-author team comes together to share our thinking about one aspect of writing. It seems appropriate that we’re sharing our thoughts about authentic purposes for writing this week. Writing is a source of power. Our students will benefit from having strong voices, clear messages, and wide audiences in our quickly changing world. Later today, I will talk about the ways we can use writing to stay in touch with people (beyond text messages). Tomorrow, Melanie will write about discovering and/or uncovering our feelings through writing. On Wednesday, Betsy will talk about the way writing can affect change. On Thursday, Beth will discuss the ways writing partners are a built-in audience that can give kids purpose. On Friday, Kathleen will help us think through ways to carve out time for authentic writing in an already jam-packed schedule. On Saturday, Lisa will discuss how writing can be shared widely. Finally, on Sunday, Deb will discuss writing and jotting around the classroom. We’ll wrap-up this series next Monday night, February 6th, with a Twitter Chat that will start at 8:30 p.m., Eastern Time. We hope you will join us. ← Join the 10th Annual March SOLSC Welcome Wagon Team! I’m excited to share this blog series with teachers in my weekly newsletter! Sounds like a great series. Looking forward to all the posts. Most of my most authentic writing has resulted from becoming a member of TWT because, finally, I had an audience of my peers, one that I knew would read, consider and respond from the heart to my posts. In fact, I am sure that I am no longer capable of anything BUT authentic writing as those of you who read my posts already know. I look forward to hearing the ways to implement this study of “authentic” writing in classrooms. I am sure the Slicers have lots of good ideas! Please put me on that list for Georgia’s book…I’m a fan! My school is contemplating having an oratory contest with students writing and original piece, and I think that the statement that you make about students having strong voices, clear messages, and wide audience is a compelling argument for this new activity at my school. So looking forward to all that’s coming up in this blog series! Teachers at my buildings understand the power of audience for authentic writing, yet this is one piece that tends to get lost in the shuffle of a scripted writing program. I am eager to read more about addressing the idea of audience in the coming days..
ways to foster students writing from their hearts. Can’t wait to read these posts! Great topic – and a great book to match! How exciting!!! So looking forward to this blog series– with the plus of possibly winning a great book! Georgia Heard has always been a fantastic teacher of writing for me! Can’t wait to get my hands on her book!! As a reading intervention teacher/coordinator I am always looking for exciting new ways to help my students and teachers improve their writing and instruction. I would love to have this book! The more authentic the purpose for writing the more authentic the writing! I am excited to uncover and learn more about authentic writing experiences. 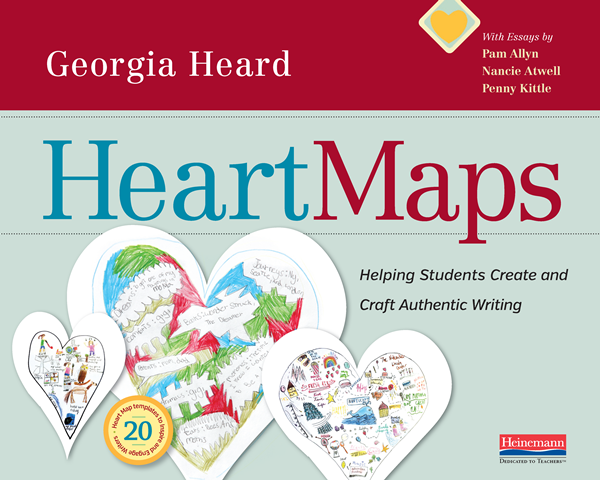 I have enjoyed reading several blogs about Heart Maps, by have yet to purchase the book! I’m very interested in what this book can do for me and my students! I’m looking forward to some of this week’s topics. We are finding that students love to write but if we can maintain authentic audiences – as you say, in a busy curricula – we can help them develop that writing to be better, stronger, more powerful. I can’t wait! I borrowed this fantastic book and used it with a group of 6th graders (chg in the world). Wow, I didn’t know the power a heart map would have in unleashing a collection of thoughts from a tough group of students! I have also used these maps with 3Rd and 1St graders, and highly recommend this book to teachers of any grade level! Writing is a matter of the heart – a connection of human spirits. When we teach writers from that perspective, the purpose is authentic and extraordinary things happen!